Performed by a Doctor of Chiropractic, adjustments are extremely safe and almost always pain-free. Chiropractic adjustments put motion into fixed joints, improve your flexibility, eliminate stiffness, improve posture and get you out of pain-FAST! After a chiropractic adjustment, you’ll feel better, move better and function better! There are many different ways to perform a chiropractic adjustment. Both Dr. Betz and Dr. Rizzo are well versed in a variety of chiropractic techniques. Some patients prefer not to hear the “popping” sound that accompanies a traditional chiropractic adjustment. We have the latest technology in instrument adjusting if manual adjusting is not a clear fit. This device is very specific as it can be adjusted to deliver from only a few ounces of force up to 50 pounds of force, depending on the patient’s condition. This technique requires a special chiropractic table that is able to separate in the middle and flex at different angles. Vertebral discs are made mostly of water but they dry out with age and the constant stress of daily activities. This therapy is aimed at providing your discs with more fluid, so they are better equipped to absorb the stresses of daily life. It is utilized to relieve pressure on the vertebral discs and to stretch the surrounding tissues. The gentle pumping motion of the involved area helps rejuvenate the discs, allow them to assume their normal position, and improve disc height. These actions move the disc away from the nerve, reducing inflammation of the nerve root and eliminating the associated pain and inflammation into the leg. When an injury occurs, the healing process lays down scar tissue to quickly brace the area. Scar tissue is fibrotic and not as flexible as healthy muscle tissue. Scar tissue limits range of motion, and in many instances causes pain, which prevents the patient from functioning as he or she did before the injury. Graston Technique is a unique approach of instrument assisted soft tissue mobilization designed to reduce and reorganize fibrotic restrictions (scar tissue). We often use this technique in conjunction with chiropractic adjustments to help fully repair an injury. Most patients find this therapy to be very relaxing and helpful. Rollers slowly travel the length of the spine, stretching spinal joints and increasing mobility. This helps to increase and restore necessary elasticity and motion to the spine, as well as improving circulation of spinal fluids. The application of small electrodes to the affected area which deliver a small current to help block pain and relax muscles. The intensity of the current is dictated by the patient, so it never exceeds a level that is uncomfortable to you. This form of treatment is used in conjunction with the application of ice or moist heat. North Brunswick Chiropractic is one of the only clinics in coastal North Carolina to provide access to the ML830 Laser. This revolutionary new treatment utilizes photons of light to augment the body’s natural healing abilities. The ML830 Laser emits light at a wavelength of 830 nanometers, which is unique in allowing deep penetration without a thermal or heating effect. In fact, Microlight Corporation (the manufacturer) patented this particular wavelength because it provides the deepest penetration among all low level lasers. Treatment is completely painless and provides true healing power. It is not an accident that the Microlight Corporation of America chose & Patented the 830nm technology for its ML830Æ. There are 30+ years of clinical studies that proved the 830nm range is the optimal wave-length. In addition to chiropractic adjustments, we use a variety of pain relieving and stabilizing rehab therapies. 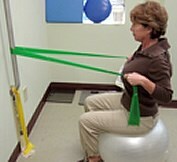 We teach you exercises in the office that you can then use at home to aid in the healing process. Chiropractic adjustments and rehab are used in combination to offer a quick and easy way to eliminate pain, stabilize the joint, and keep you pain free and functioning at your best for years to come. We use Web Exercises to give you the best in Exercise Prescription.